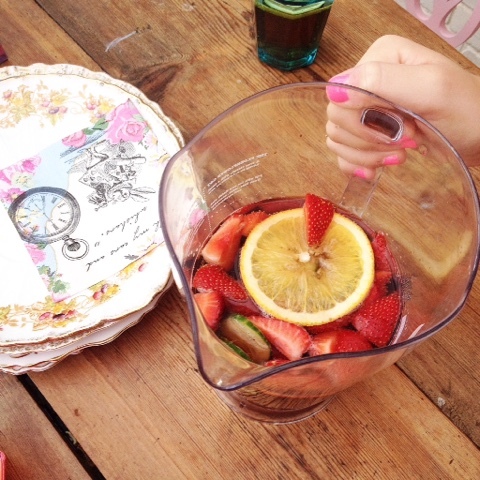 My little girl has just had a mocktail making party and my non alcoholic pimms went down a storm! Anyhoo less rambling, here we go. You will need all the usual fruit- Strawberries, oranges etc. Mint is optional, cucumber is crucial! Lemonade, and the secret ingredient.... Balsamic vinegar! Now the cucumber and the balsamic are key! They are what brings this recipe together! Chop everything as normal and top up the jug with lemonade, now add about a tablespoon of balsamic and give it a muddle. Adjust balsamic amount to taste.